It’s probably safe to say that we all love Google. A basic Google search is so effective and so danged useful that we mostly overlook the things Google DOESN’T do. Google gets blocked by anything that isn’t clean HTML or PDF. It can’t fill in a form to query a database. It can’t go past anything requiring a fee, a subscription, or a password. 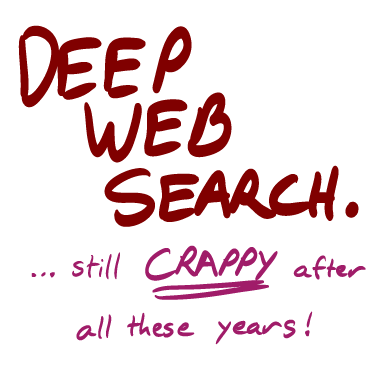 The part of the web that Google can’t reach is called the Deep Web, and it happens to be non-trivial. Best estimates put it around 500 times larger than the Surface Web, in terabytes. But that’s not what actually matters. What’s important is that much of the highest-quality content is housed there. There’s good stuff underneath the Surface Web, that we wish we could get at.